"Leonard Rossiter's performance, and Eric Chappell's excellent scripts, made Rising Damp an extra special creation" BBC - Comedy Guide. 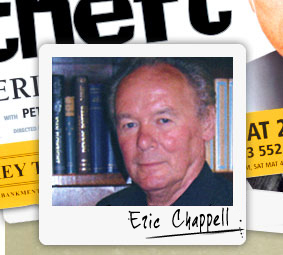 "Packed with marvellous lines delivered at a cracking pace" The Observer on Eric Chappell's 'Theft'. "We are delighted to have the well-known playwright and TV writer, Eric Chappell as a new Patron." - Robin Hood Theatre, Averham. "Writer Eric Chappell, whose pen produced the classic Rising Damp, once again turned in four series of sparkling scripts." - Television Heaven about Home to Roost.